I was looking, amongst all the utter dross, for something to watch on TV before I went to bed last night. It’s not an easy task, with a multi-channel choice of nonsense hiding anything worth giving up an hour of your time for. As usual, I drifted off towards BBC4 on the iPlayer. Tucked away in the background I found a little gem called ‘Don McCullin – Looking For England’. I have long been a admirer of McCullin who is, in my opinion the best photographer Britain has ever produced. A working class boy born in the slums of North London, he found a career in war photography. This was after selling photos of his own street gang to The Observer newspaper. McCullin went onto work for The Times in the days when it was respected as broadsheet, not the rag it is today. He photographed everything from the construction of the Berlin Wall, to Vietnam, The Congo and Lebanon. Sadly, his career at The Times ended when Murdoch took over and was instructed by Margaret Thatcher to remove McCullin from ‘The Falklands Conflict’. Thatcher didn’t want British people to see the misery of war, she just wanted victory parades and Union Jacks. It was her Churchill moment, although Argentina weren’t exactly the force of 1930’s Germany. Now 83 years old, McCullin is still working. In this documentary he travels around England photographing all aspects of the British class system. From a Wiltshire hunt to the down and outs of North London, he snaps away capturing moments in time. There is some really poignant and funny stuff in there too. On Eastbourne Seafront he got lost in a moment uncontrollable laughter as the brass band continued to play in the rain. It was hosing it down but the stoical fools carried on regardless. As McCullin said, it was like a Monty Python sketch. Perhaps my favourite part of the programme was when McCullin returned to Scarborough. He was there to recreate his picture of lads playing football on the beach and was approached by a man who was in the original photo. It was lip wobbling moment. I have been despairing lately. We live in a country where MP’s who are supposed to represent us, are representing themselves. By protecting themselves they are causing huge damage to the credibility of Britain. They are serving to maintain the status quo amongst themselves. Why? So they can continue taking backhanders, avoid paying taxes and continue to sit on the payroll of big business and offshore media groups. Don McCullin is a decent chap. An extremely talented individual who, from humblest of beginnings used his eye as his tool of work. His view of the world is one of a man who has seen everything and he often despairs the way we are heading. The fact that this little documentary is hidden in the backwaters of BBC 4 whilst idiots laud corrupt buffoons like Boris Johnson and Jacob Rees Mogg, tells you all you need to know. Compare the talent of those hopeless privileged Etonians with a chap born in a slum who watched his dad die of bronchitis. We are a nation where the lunatics have taken over the asylum. 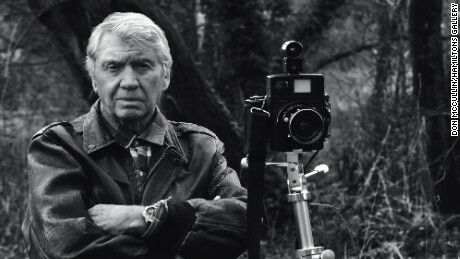 You can see the Don McCullin documentary here. 1 Reply to "Don McCullin - Looking for England"
Great tea-break read. I will watch it tonight sounds good.